One of the most revered destinations among Muslims, Sultan Ahmed Shah Mosque is a well-known mosque in the Ahmedabad city, famous for its well-endowed architecture and historical significance. The religious place has been in existence since 1414 AD and was founded by Sultan Ahmed Shah, hence the name. Its beautifully designed walls bespeak of the thoughtfulness and spiritual sentiments put into it during its construction and mark it as a beautiful specimen of architecture to look at. To add more to it, it is located within close vicinity of many other attractions such as Bhadra Fort and Teen Darwaza. The interiors of the place, mainly the prayer hall is established in black and white to provide it with the serene ambience. On moving further on the north eastern side, you will see the ‘Zenana’ area specifically built for female devouts to pray. One of the earliest mosques, its stone pillars and Jali Screens makes it a sought out destination for tourists and pilgrims alike. Avoid visiting during prayer hours. Wear Modest Clothing and Cover your head. Can be visited in the evening too. How popular is Ahmed Shah's Mosque? People normally club together Sunset Drive In Cinema and Alphaone Mall while planning their visit to Ahmed Shah's Mosque. 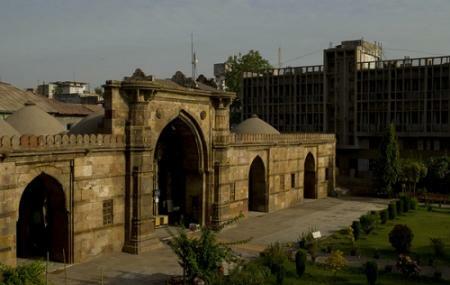 First mosque of Ahmedabad City. Built-up by Sultan Ahmedshah, King of Ahmedabad City. Red Stone construction, and Stone carving, Amazing peace for praying Namaz. I love Islamic mosque.